(Nanowerk News) Liquid water, as well as other liquids, exhibits characteristic vibrations upon excitation with electromagnetic waves over a wide spectral range. At frequencies which correspond to infrared light, vibrational motions within single molecules can be observed. "At lower frequencies, in the Terahertz range, which is situated between the frequencies of the infrared light and microwave radiation in the electromagnetic spectrum, far more complex motions take place involving motions of whole water molecules relative to each other", explains Terahertz specialist Prof. Havenith-Newen. "In particular, these motions involve closing and breaking of the three dimensional hydrogen bond network of water, which interconnects water molecules and is responsible for the unique properties of water." Observations of this kind have become feasible only lately with the development of advanced laser light sources. Studies performed at the RUB lead to the discovery of an unexpectedly long ranged influence of biologically relevant solutes, such as sugars and proteins, on the motions of water, the so-called "Terahertz-dance" of water ("Dissecting the THz spectrum of liquid water from first principles via correlations in time and space"). In the vicinity of the molecule, water motion is highly ordered: "While water molecules usually behave like disco dancers, in the proximity of biomolecules they perform a minuet", says Prof. Havenith-Newen. However, until now a detailed explanation of this unexpected phenomenon was not available. The underlying vibrational motions between water molecules are extremely complex. So far it was not possible to explain the experimental result with a molecular mechanism. 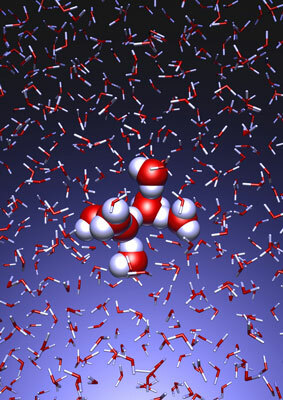 In a joint effort, scientists of both departments performed molecular dynamics simulations of water, which in contrast to conventional approaches, are not based on empirical models for the interactions between molecules, but employ ab initio calculations. For the first time such simulations have been carried out on a scale which allows for statistically meaningful statements about the comparably slow vibrational motions between the water molecules. These extensive calculations were supported by the Leibniz Computing Center in Garching near Munich, which granted access to computational resources on the national supercomputer HLRB2. The use of newly developed analysis methods yielded a precise description of the THz vibrations in water as a correlated motion of many water molecules: a sort of motion of water droplets within the water. "Therefore we have uncovered 'the choreography of pure water' at low frequencies", says Prof. Marx. If another substance, such as a protein, is dissolved in water, it "perturbs" this choreography at its interface. This allows for a qualitative understanding of the experimental results using THz spectroscopy. "The correlated motions of water molecules at THz frequencies exhibit entirely new characteristics, which are significantly different from the well-known infrared vibrations of the chemical bonds within a molecule", explains Prof. Marx. As this study shows, the latter are well described as localized vibrational motions within single molecules as well as direct neighbors. This is in stark contrast to the choreography of the THz dance of water: Here, many water molecules, connected only indirectly via hydrogen bonds, move together in a concerted motion in space and time. It is the change of this correlation, evoked by the biomolecule-water interface, which is detected by THz spectroscopy and used for technological applications. Research Department "Interfacial Systems Chemistry"
The interdisciplinary cooperation started within the Research Department "Interfacial Systems Chemistry" of the RUB and was supported by the Humboldt foundation. Only lately, in the end of may, the results were presented to the scientific community for the first time during the Leopoldina symposium: "The Complexity Connecting Biomolecular Structure and Solvation Dynamics" held at the RUB.